WHAT DOES THIS CONTACTOR DO? The contactor's purpose is to send 230 Volts to the Air Conditioning Condenser or Heat Pump compressor, crankcase heater and out door fan motor. The way it works is as follows if you have a residential system. 24 Volts of power from your thermostat is applied to the (2) side terminals of the contactor (if it is a 24 volt system, see coil voltages below) (all residential systems use 24 volt coils) assuming your thermostat is calling for cooling in the case of an Air Conditioner. In the case of a Heat Pump 24 volt power is applied to these side terminals on Heat Or Cooling. The large terminal screws always have 230 Volts of power applied to the (2) lower terminals in the picture. Your compressor and fan motor wire leads are connected to the (2) top terminals in the picture. As your thermostat calls for heating or cooling the 24 volt coil "Pulls" in through a magnetic action, making contact from the always powered 230 volt side of the contactor (called the LINE side) to the compressor and fan motor side (called the LOAD side). When the thermostat de energizes the contactor opens and totally stop all power to the equipment. Note the burnt contacts below, this contactor is giving low voltage to the compressor and fan motor and can cause serious electrical damage to the equipment. Contactors usually need to be changed every 5 years under normal operation. Below is a single pole contactor with a 24 Volt coil. The white and black wires on the right, each send 120 Volts to the contactor from the buildings power source. As the contactor pulls in and out, it breaks power to the compressor and fan motor through the upper circuit (white wire) however the bottom circuit never gets broken (because of the copper bar that joins the 2 screws), so this contactor is relying on dropping 120 Volts instead of 240 volts to make the equipment start and stop. These contactors are popular with all the manufacturers. 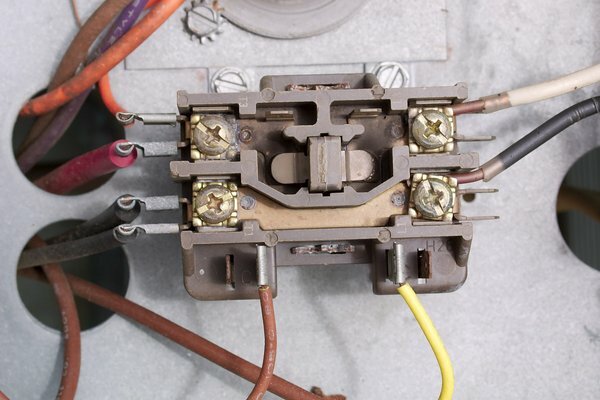 Since the contactor is always arching from 240 volts being applied across the contacts, it doesn't take too many years before the contacts get burnt and pitted. This pitting doesn't allow a full 240 volts of power from getting to the compressor and fan motor. This is known as "Voltage Drop". This Voltage Drop results in HEAT which then leads to burnt wires and possibly burnt motors and compressors. Wear on the sliding mechanism. Your existing single pole or double pole residential contactor may be rated at 20 amps or 25 amps. Just buy the 30 amp contactor from us (it will last longer). We have made the decision to sell only 30 amp models since there is no advantage to buying a 20 or 25 amp rated contactor since the price is the same! The other reason is because through the years of operation the plastic part that the contacts slide in, wear to the point that the contactor can stick closed which can lead to frozen evaporator coils and burnt out compressors. If you think your outdoor unit is still running even though the indoor fan has stopped, suspect a sticking contactor! Change it before you ruin a $1,000.00 compressor! 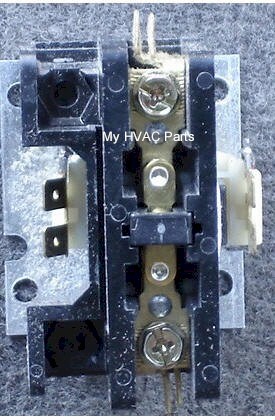 Below is a picture of a normal (2) pole contactor found in smaller sizes of central air conditioning condensers and heat pumps (ranging usually from 1 1/2 tons to about 3 tons). There are different "Coil" voltages used by the manufacturers. Coil voltages are almost always 24 Volts in the size shown below on residential systems, but before ordering, read the label on your present contactor to be sure it is in fact a 24 volt coil (if it is a residential system, then it is a 24 volt coil). 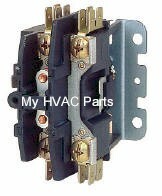 Installing a 24 volt coil in a 240 volt coil application will instantly burn out the new contactor coil! If the label is gone or faded and you can't read it, consult the manufacturer's documentation that came with the equipment or read the wiring diagram usually found on one of the air conditioner or heat pump cabinet panels. If STILL unsure consult a Heating and Air Conditioning Contractor. If you have a Single Pole Contactor see the 2nd picture. Below is a TRUE Single Pole Contactor. Notice the absence of any metal bar on the left. We don't carry any of this type because it would require you to "wire nut" some of your existing wires together since there is no metal bar and terminal screws to make the connection. Our site calls our Single Pole Contactors 1+ Pole (meaning there "is" a metal bar and terminal screws as well as spades to hook wires to.) This may or may not be the case on other web sites?? Many people that have a single pole buy a (2) pole to replace it with since they can simply join one side together and actually get double the life out of the contacts since once the contacts show wear they can move the wires over to the new set of contacts. LARGER SYSTEMS USE LARGER CONTACTORS. Shown below is a 40 amp contactor (3 Pole) (there are 2 Poles available also) with a 24 Volt Coil found usually, in larger Air Conditioners and Heat Pumps. (The coil wires go to the 2 small brass screws on the top/rear of the contactor). Here is where you really have to be careful as coil voltages are some times 120 or 230 volt and NOT 24 volts. Be sure what the voltage is before ordering! 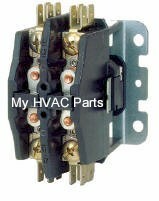 The 40 Amp Contactor below uses a 240 Volt coil. (The coil wires go to the 2 small brass screws on the top/rear of the contactor). Even though the main terminals look the same as the picture above, they ARE NOT THE SAME. Installing a 24 Volt coil contactor in a 240 Volt application will INSTANTLY burn the coil out! HOW DO I CHANGE THE CONTACTOR? Changing the contactor involves first being sure the main 240 volt power is off by shutting off your circuit breaker on your main electric panel. Obviously, we are working with 240 Volts of power which can be lethal! BE SURE THE POWER IS OFF. THERE MAY BE MORE THAT (1) CIRCUIT BREAKER. IF UN SURE SHUT THEM ALL OFF. If STILL unsure consult a Heating and Air Conditioning Contractor. Next you must short out all the terminals of your present contactor to bare metal such as the cabinet using an insulated tool such as a screwdriver. The capacitors themselves can be discharged at their own terminals the same way. Your unit usually will have 2 capacitors, one for the compressor and one for the fan motor. Still other units incorporate a dual usage capacitor that runs the fan motor and the compressor. We have to do this as there are capacitors in your unit which store a high amount of power and while it won't kill you, (unless you REALLY DON'T HAVE THE MAIN POWER OFF! )it will give a nasty shock. This shock would feel like a shock from a spark plug in a car! See the picture below of a typical run capacitor. Once these steps are done, label all the wires in some manner that you will understand. It is best to remove only (1) wire at a time, re installing it on the same terminal on the new contactor. This way there will much less of a chance of mis wiring. Complete all the wire changes. Turn the main circuit breaker back on and set your thermostat for a call for heating or cooling. PLEASE NOTE: THE CONTACTOR YOU RECEIVE WILL BE SIMILAR BUT WE GET ITEMS FROM DIFFERENT MANUFACTURERS FROM TIME TO TIME. When reading the chart below, Ind. F/L Amps stands for Inductive Full Load Amps as would be the maximum amps from a running compressor for instance, that the contacts can stand. Res. Amps stand for for instance the Maximum Amps it can stand if an Electric Resistance Heater using from 240-600 Volts AC were installed on the contactor.